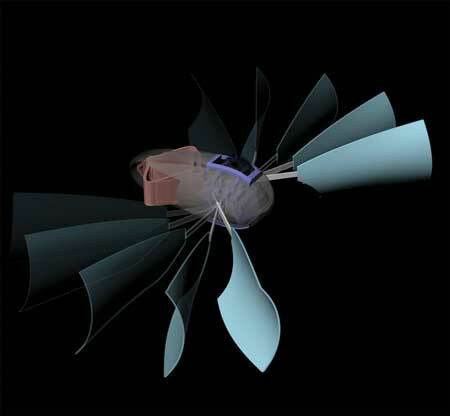 (Nanowerk News) Engineers at Caltech and ETH Zurich have developed robots capable of self-propulsion without using any motors, servos, or power supply. Instead, these first-of-their-kind devices paddle through water as the material they are constructed from deforms with temperature changes. The work blurs the boundary between materials and robots. In the self-propelled devices, the material itself makes the machine function. "Our examples show that we can use structured materials that deform in response to environmental cues, to control and propel robots," says Daraio, professor of mechanical engineering and applied physics in Caltech's Division of Engineering and Applied Science, and corresponding author of a paper unveiling the robots that appears in the Proceedings of the National Academy of Sciences ("Harnessing bistability for directional propulsion of soft, untethered robots"). The new propulsion system relies on strips of a flexible polymer that is curled when cold and stretches out when warm. The polymer is positioned to activate a switch inside the robot's body, that is in turn attached to a paddle that rows it forward like a rowboat. The switch is made from a bistable element, which is a component that can be stable in two distinct geometries. In this case, it is built from strips of an elastic material that, when pushed on by the polymer, snaps from one position to another. When the cold robot is placed in warm water, the polymer stretches out, activates the switch, and the resulting sudden release of energy paddles the robot forward. The polymer strips can also be "tuned" to give specific responses at different times: that is, a thicker strip will take longer to warm up, stretch out, and ultimately activate its paddle than a thinner strip. This tunability allows the team to design robots capable of turning and moving at different speeds. The research builds on previous work by Daraio and Dennis Kochmann, professor of aerospace at Caltech. They used chains of bistable elements to transmit signals and build computer-like logic gates. In the latest iteration of the design, Daraio's team and collaborators were able to link up the polymer elements and switches in such a way to make a four-paddled robot propel itself forward, drop off a small payload (in this case, a token with a Caltech seal emblazoned on it), and then paddle backward. "Combining simple motions together, we were able to embed programming into the material to carry out a sequence of complex behaviors," says Caltech postdoctoral scholar Osama R. Bilal, co-first author of the PNAS paper. In the future, more functionalities and responsivities can be added, for example using polymers that respond to other environmental cues, like pH or salinity. Future versions of the robots could contain chemical spills or, on a smaller scale, deliver drugs, the researchers say. Currently, when the bistable elements snap and release their energy, they must be manually reset in order to work again. Next, the team plans to explore ways to redesign the bistable elements so that they are self-resetting when water temperature shifts again--making them potentially capable of swimming on indefinitely, so long as water temperature keeps fluctuating.